Monday night suppers have to be easy because I volunteer from 4:15-6:45. 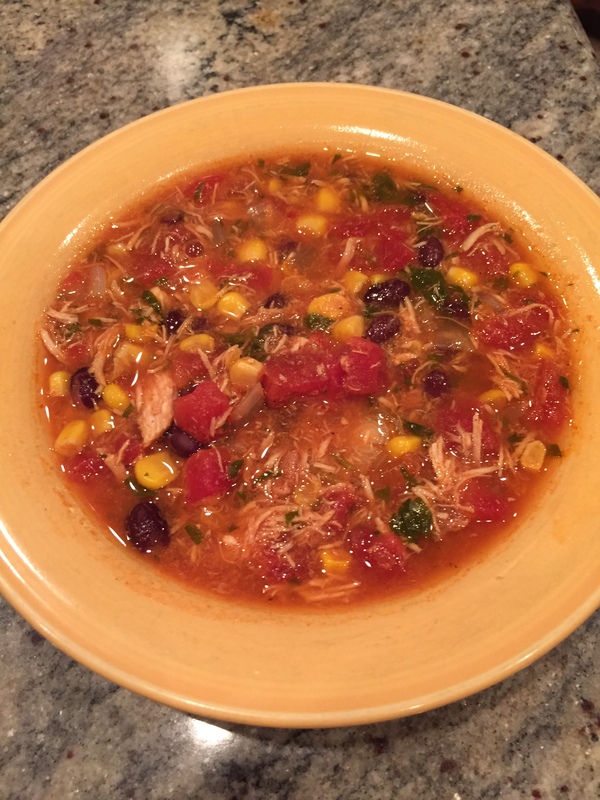 Mexican chicken in the slow cooker has become a staple. Place a few boneless, skinless breasts in there with a jar of your favorite salsa and some (homemade, please!) taco seasoning, and it will shred beautifully in a few short hours. It can be used for quesadillas, tacos, enchiladas, nachos, or this easy and delicious tortilla soup! I was quite amazed that 30 min. after merely dumping all of the ingredients in a pot at the same time, the soup looked restaurant quality! Cook’s tip: Enlist someone to open all those cans while you chop the onion and cilantro, and you’ll be done in half the time! Dump everything in a pot and simmer for 30 minutes. Garnish with cheese and crispy tortilla strips if desired.